This page is dedicated to one person, Jesus Christ, who walked this earth some 2000 years ago. He had a wonderful mission; to save Man from his shackles of sin, sickness and death. And he had a great message; Very truly I tell you, whoever hears my word and believes him who sent me has eternal life. It is difficult to remain neutral before the name of Jesus Christ. Something often observed is how the same people who contemptuously scoff at the Christian faith, in the same breath sit down and read today's horoscope, or get captivated by all sorts of occult phenomena. It almost seems as if people today are willing to believe in almost anything, except Jesus of the Bible. Once I heard someone on TV say that he certainly believed as much in Saida (a well-known, now deceased, soothsayer in Sweden) as in Jesus. Yet it is hardly Saida you call on when you are in distress or danger. When things really matter we know what matters. How can it be that the name of Jesus is so controversial if he was just a kind-hearted, inoffensive philosopher and harmless teacher of wisdom and ethics, as many would argue? 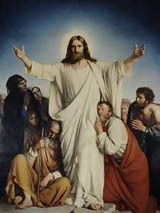 Could it be that Jesus really is who he says he is; God himself, come to earth to save Man from an untenable situation? Could it be that something within Man reacts strongly whenever Jesus is mentioned? Maybe something very sensitive is being touched upon? If you want to know more about Christian faith, more than what you learnt in school, there is much to read on this page. In the links below, I try to provide answers to frequently asked questions about Christian faith and I am also trying to sort out various misconceptions. If you have objections or questions, please e-mail me. (To translate from Hebrew or Greek or Aramaic to English always leads to compromises. To be able to read the Bible in its original languages, the only solution would be to become an expert on these languages yourself. This would avoid the problems of imperfect translations. Obviously this is not doable for most people. The next best thing is to have access to several different Bible translations and Commentaries on the Bible. By reading these, you will get a better picture of the depth and essence of what the Bible is trying to tell us. What does Christianity have to say about the dreadful terror attacks of 9/11? Christianity is dead. Why bother? Why is it so hard to be neutral before Jesus? "I'm not interested. I do not need any Jesus!" or put differently, "If Jesus is the answer, what is the question?" But isn't the Bible misogynist? Are not women subordinate to men according to Paul? We do not need Jesus. Philosophers and politicians can solve all problems. Why is the world so full of evil if it was created by a good God? But why cannot God just remove evil, if he is omnipotent? God is your friend, not your enemy! But I do not understand what the cross means. How can it help me? Jesus' crucifixion was exactly foretold in the Old Testament, 700 years in advance! Is there an absolute Truth, or is the Truth just an opinion? Myths and fairy tales do not solve any problems! Science and logic is the answer! The philosophy of Enlightenment  science or religion? Is there anything to suggest that the Bible really is true? The resurrection of Jesus  beautiful symbolism, or a real event? Liberal theology  a failed attempt to explain away the God of the Bible. The Old Testament, the Gospels and the apostle Paul  are they contradicting one another? IF THERE IS A GOD, WHY WOULD IT BE THE GOD OF THE BIBLE? MIRACLES AND ANSWER TO PRAYERS  ARE THERE SUCH THINGS? The Bible Code  what to make of it? The legalistic man or "are some sins worse than others?" Is God really fair? What happens for example to people who never heard about Jesus? How can you meet Jesus?